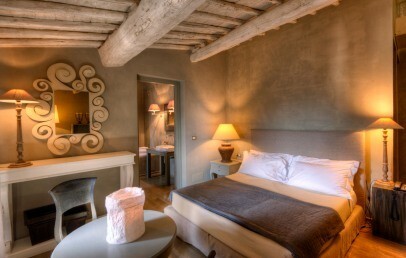 A small oasis of luxury and relaxation immersed in the lush Tuscan hinterland. 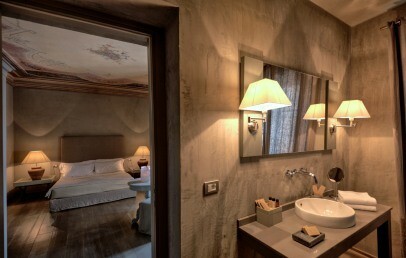 Situated in a village named Moncioni, bordering the valley of the Arno and beautifully overlooking the renowned hills of Chianti, Villa Sassolini enjoys an enviable position: it is ideal for exclusive holidays for its unique romantic atmosphere. At an hour drive from here there are Florence, Siena and Arezzo, where art and culture lovers will find a wide choice of itineraries. This beautiful Villa built in the fourteenth century and recently restored has now become the prestigious residence Villa Sassolini. It was once the summer residence of important aristocratic Florentine families, like the counts Guidi, and stands out in the vast panorama of Tuscan estates, that offer accommodation for its ability in blending traditional charm with contemporary chic design. The property has retained the freshness of its ancient and original facade, while the interior has been restored following a modern and contemporary design characterized by minimalist traits. In the main building, in addition to the rooms located at the first and second floor, there is the reception, the restaurant and a large terrace overlooking the outdoor pool. In the new annexe building at 50 meters from the Villa there are two more double bedrooms, the new small SPA and a cookery school. The residence has also a lush garden, where lavender, roses and rosemary combined give rise to a mixture of colours and fragrances. Of great importance is the high quality of service and the careful attention to the guest, who is immediately captured by the discreet harmony that reigns in the Villa Sassolini. 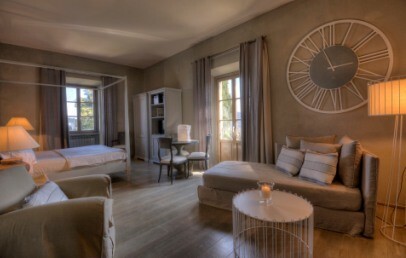 Classic, Deluxe, Junior Suite, Suite and Family Suite are the accommodations available at Villa Sassolini with lovely views over the village, the garden or the Chianti hills. 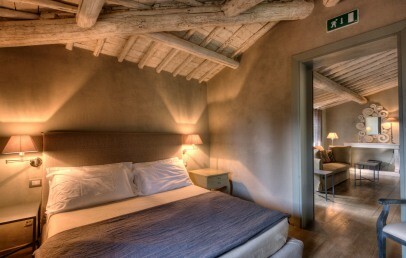 They are spacious and elegant, decorated in the shades of beige, white and gray, with wooden floors and exposed beams or frescoed ceilings. 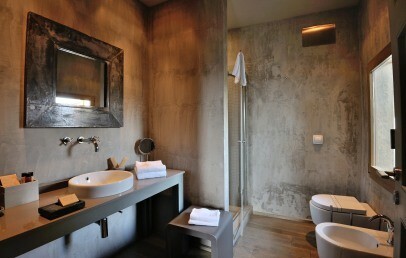 The decor is simple and functional, but designed specifically to give the feeling of a warm and familiar atmosphere. 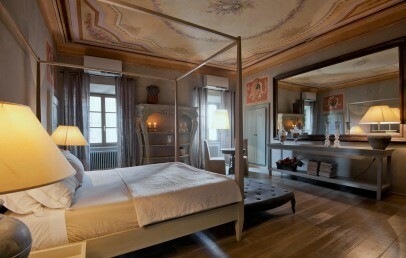 Some have a romantic canopy bed others have a large double bed and a living corner or a separate living room. All accommodations are equipped with the modern comforts like a safe, minibar, hairdryer, internet access, air conditioning, television with satellite channels. 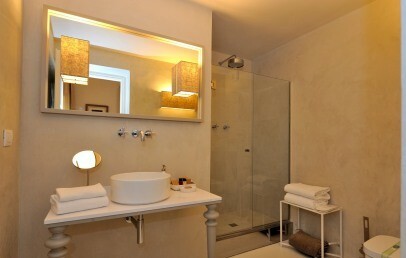 At guests’ disposal there is the restaurant Villa Sassolini with elegant furnishings and attention to detail. It provides the best regional cuisine with a fine selection of dishes prepared with high quality ingredients. 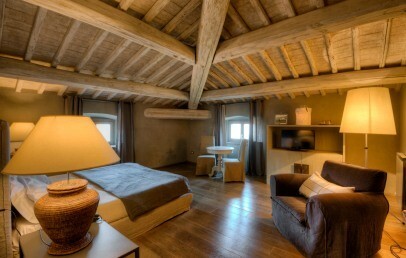 The taste of food is then enhanced by top quality wines from Tuscany and from the best international wine producers. Dinner is usually served in the elegant lounge and during the summer months in the rooftop terrace, where you also have breakfast. 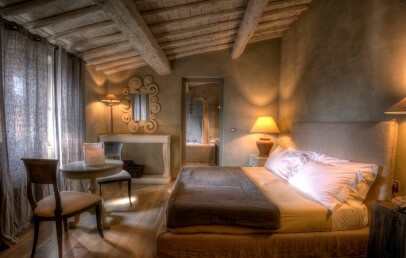 The service is extremely nice and paying special attention to meet all the needs of its guests. Cooking lessons, SPA, baby-sitter (on request, extra charge), reading room, fax and photocopies service, bike rental (on request). The “Golf course Ugolino” is at one hour by car from Villa Sassolini and in the vicinity it is possible to practice horse back riding. The Villa Sassolini disposes of a swimming pool surrounded by elegant chairs for sunbathing from where guests can enjoy a splendid view over the hills of Chianti. 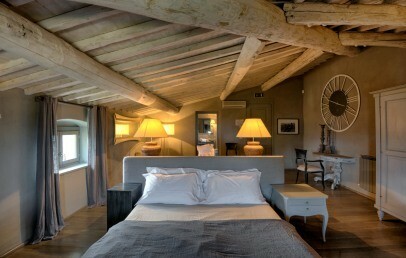 Ideal place for a relaxing holiday immersed in the peace of nature. For those who would rather let themselves be temped by the habits of everyday life, for a good shopping in Montevarchi there is the Prada outlet. 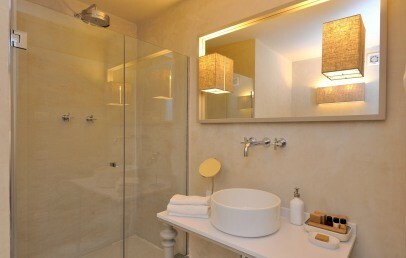 Cozy double rooms, furnished in a minimal elegant style with relaxing beige, white and chocolate colours. 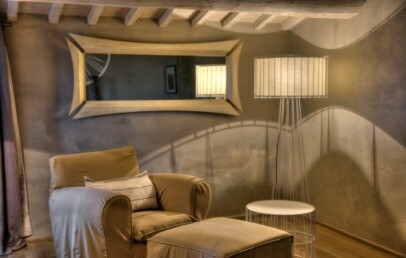 They are characterized by wooden beams, curtains with soft fabrics and soft decoration. 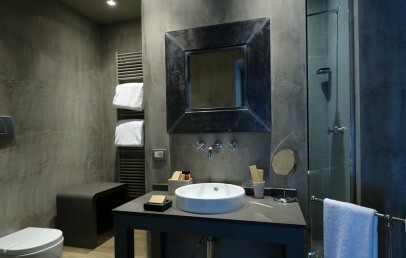 The private bathroom has a shower, a hairdryer, a make-up mirror and complimentary toiletries. 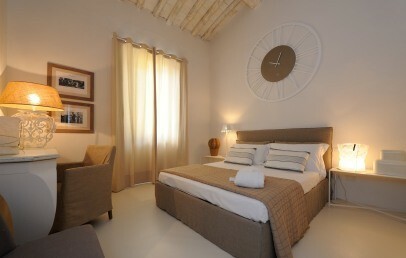 The standard rooms are located in the annexe building at approx. 30 m from the Villa. One room offer a view on the valley and the other on a alley of the village. 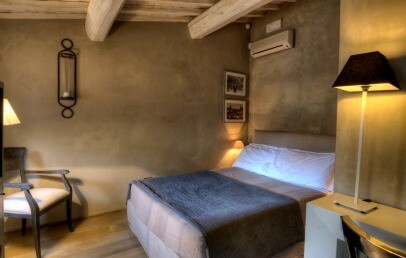 Spacious and bright double room, elegantly furnished in the shades of gray, with wooden floors and natural fabrics and design objects. 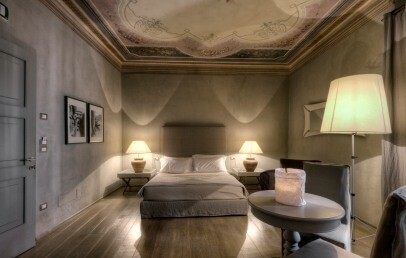 They have frescoed ceiling or ceiling with wooden beams and table and chairs. The bathroom has either a tub with separate shower or only shower. The view is on the narrow alleys of the village or is a panoramic view on the garden. 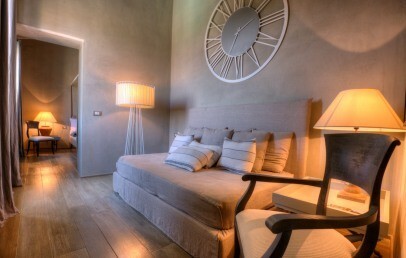 The Suites of the Villa are different from each other, each one has its own unique features and details. They are spacious and bright and have a bedroom and a separate living room. Everyone has prevailing colors in the shades of gray and are furnished with an elegant style that combines the Gustavian era to modern design. 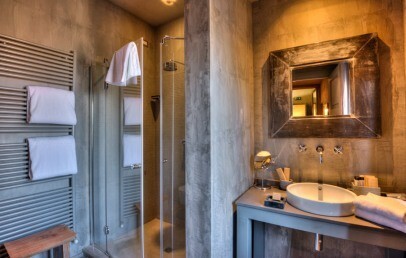 The bathroom has either a tub with separate shower or only shower and hairdryer. Some Suites offer a nice overview from the windows on the village or garden and only one has a small balcony with view over the Chianti hills.